South Jersey’s newest luxury showroom. Hyundai’s all-new, much-anticipated sedan, the 2011 Equus—which has been drawing comparisons to the exclusive Mercedes-Benz S-Class, BMW 7-series and Lexus LS460L—has taken the Korean automaker to a new class of luxury. The same can be said for Marlton’s Burns Hyundai, where a sleek, newly renovated showroom on Route 70 has elevated South Jersey’s premier dealership into a class all its own. The crown jewel of the new Burns Hyundai facility is its premium “showroom within a showroom,” dedicated solely to the Equus. Along with a new luxury image, the modern facility is complete with customer-friendly amenities, such as a private service write-up area with extended hours, including Saturdays. Customers can expect same- or next-day service appointments. “The reason that Burns Hyundai has been the sales leader all these years is because the customers find a better shopping and buying experience here, followed by a better ownership experience,” explains Peter Lanzavecchia, executive vice president and co-owner of Burns Hyundai. The new facility includes a relaxing customer lounge, featuring worktables and WiFi to accommodate busy working professionals. There’s also a “members only” V.I.P. lounge and conference room exclusively for premium customers, owners of the high-end Genesis and Equus models. The V.I.P. lounge and adjacent conference room allow business presentations and meetings, and features computer workstations with WiFi, a large projection screen and gourmet refreshments. Customer satisfaction is a key reason why Burns Hyundai has been the No. 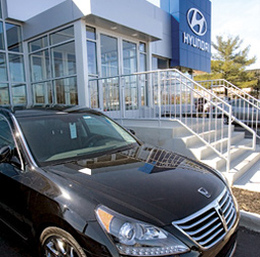 1 Philadelphia-area Hyundai dealership in sales since it opened in 1999. Burns Hyundai prides itself on being a leader of change within the auto industry. The Burns organization was the first to include employees’ home phone numbers on business cards 25 years ago, a common industry trend now. At Burns Hyundai, they’ve taken this customer-centered philosophy one step further. Every client receives owner Peter Lanzavecchia’s personal business card, which includes his home and cell numbers and email address. “We need to be accountable to our customers 24/7, and when they have a question we need to be there,” says Lanzavecchia, adding that employees are carefully screened prior to being hired, and then receive ongoing training and support. Only half the Hyundai dealerships nationwide are authorized to sell the new, ultra-luxurious Equus sedan, and Burns Hyundai is one of them. Having met required sales and facility criteria established by Hyundai corporate, Burns is poised to compete with Mercedes-Benz, BMW and Lexus in the luxury sedan category. Powered by a 385-hp V-8 engine, the Equus boasts many performance and luxury features including front and rear heated and cooled seats with massage, rear console refrigerator, full passenger entertainment system, nine airbags, five years of free maintenance, and a 17-speaker Lexicon audio system with satellite radio found elsewhere only in Bentleys. Most convenient is the unique “Your Time, Your Place” valet service that accompanies the Equus. The service begins with the initial test-drive and continues throughout the ownership experience. A personal “Equus champion,” dressed in a suit and tie, will drop off a loaner luxury sedan to your home or office; pick up your Equus to perform any necessary maintenance; then wash, wax and vacuum the car; and finally return it to your home or office with a full tank of gas. Every Equus comes with a complimentary iPad that features an owner’s manual and one-touch access to the Customer Connect Center for questions or appointments, seven days a week. Now is a great time to shop for your new Burns Hyundai. The 2011 models continue to offer excellent fuel economy and safety, impressive styling and attractive financing. Check out the newly restyled 2011 Sonata, a finalist for North American Car of the Year, and the fuel-efficient Sonata Hybrid and Elantra, which have garnered great reviews. All models are backed by the famous Hyundai Assurance, which includes a 10-year/100,000 warranty, five years of roadside assistance, and buyer protection to cover unexpected job loss. Value, luxury, service and a brand new home—Burns Hyundai in Marlton has it all. Stop by and see for yourself. 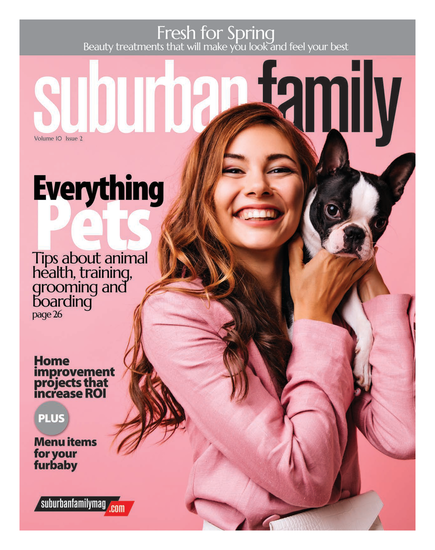 Published (and copyrighted) in Suburban Family Magazine, Volume 2, Issue 1 (March, 2011).